Always dreamt of that quintessential romantic moment with bae in front of the Taj Mahal? Well, for all the couples in Pune, we at LBB, have found a beautiful replica of the Taj, near Aurangabad, just five hours from Pune and seven hours from Mumbai. Bibi Ka Maqbara is believed to be built in the year 1678 by Mughal Emperor Aurangzeb’s son, Azam Shah in the memory of his mother Begum Rabia Durani. The structure is not as large as the Taj, however, it does have an uncanny resemblance which makes it an immediate tourist attraction. Known as the Dakkhani Taj, the mausoleum is laid out in a quadrilateral garden layout. Standing tall and proud on a high square platform with four minarets at its corners, Bibi Ka Maqbara was constructed by architect Ata-ullah and engineer Hanspat Rai. In fact, Ata-ullah was the son of Ustad Ahmad Lahauri, the chief designer of the Taj Mahal. History has it that the marble for Bibi Ka Maqbara was brought from the mines near Jaipur and the construction cost was about INR 7 lakh! The place is quiet and serene. And what really matters in that you can sit there in peace for hours with your loved one. Besides, a long drive to Aurangabad on a weekend sounds like a perfect getaway. 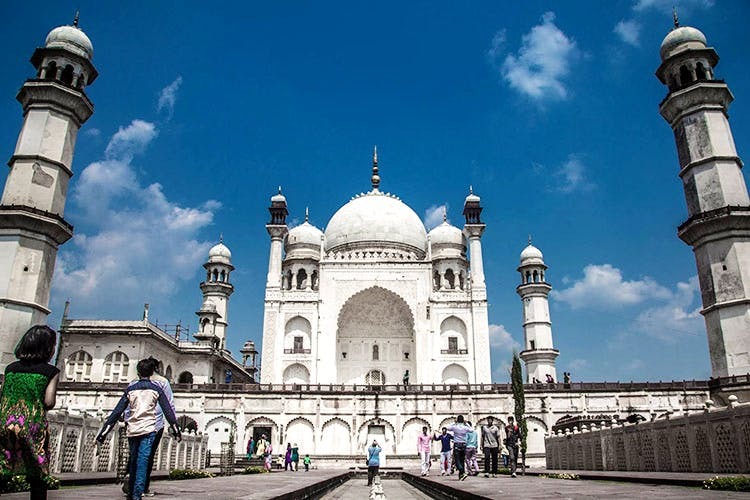 Bibi Ka Maqbara is an elegant monument that celebrates love and life! The place may not be a jaw-dropping replica of the Taj but definitely makes for a sweet romantic getaway with your partner.